My husband and I just came back from visiting New Orleans and we had such a wonderful time. This is our third time visiting and we can't wait to go back again. 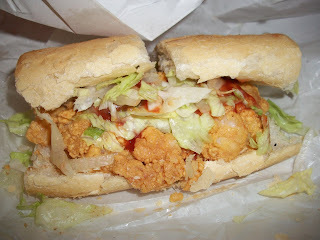 One of the things we always order in New Orleans are Po Boy Sandwiches from Johnny's Po Boy's in the French Quarter. I always order the fried shrimp but they have every po boy sandwich you can think of. These sandwiches are so delicious so I wanted to find a sandwich similar to the ones I had in Louisana. I went to one my favorite site, http://www.recipezaar.com/ and found this recipe. This recipe is very comparable to what I had in New Orleans. It was so flavorful. I did add some ketchup to the remoulade sauce but I am sure it would be just as good without it. Very tasty! I wrapped these suckers up in white paper and took these with us on a picnic. Take the ingredients for the Remoulade Sauce: Mayonnaise, horseradish, pickled relish, salt, white pepper, garlic powder, paprika,lemon juice. Combine all ingredients in a large bowl and whisk until combined. Refrigerate. Clean and devein 6-8 medium shrimp. Prepare 3 bowls. Add salt, pepper, and all other spices to the flour. Divide the flour between the first two bowls. Combine and beat the egg and milk in the third bowl. Arrange the bowls so you have flour, egg wash, and flour. Heat the oil until a drop of flour placed in the pan dances around. Working left to right and starting with the left hand, coat the shrimp with flour from the first bowl and place into the egg wash. Using the right hand, remove the shrimp from the egg wash and place in the last bowl of flour. Coat evenly and carefully place into oil. Cook until browned on both sides. Serve with remoulade sauce on Ciabatta bread "dressed" with lettuce and tomato.